Cape Dorset is a small town in Nunavut, a territory in the Canadian Arctic. It gets very cold there, as you can imagine! The native people of the area are called Inuit. 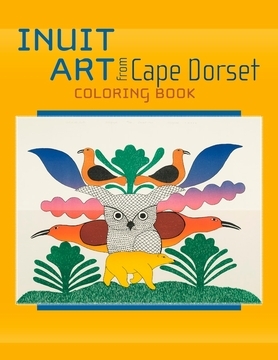 In this coloring book you’ll find 22 pictures created by 10 different Inuit artists from Cape Dorset. The pictures are shown as small reproductions on the inside front and back covers. 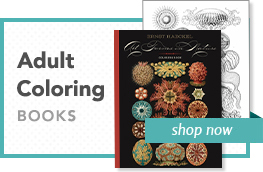 When you color them, you might want to try to copy the colors the artists used, or you might choose your own. You’ll notice that the Inuit artists make pictures of the animals and people of their community. You’ll see owls and other birds, polar bears, seals, and fish, as well as people dressed in warm clothes. The pictures are very magical, don’t you think? The last page of this book is blank so that you can create your own picture. Think about a particular animal or type of person that lives in your state or province, but that might not live in other places. For instance, if you live in Florida, you might draw a flamingo. If you live in Ontario, you might draw a moose. If you live in New York City, you might draw a street musician!